Until you are Outraged over how many Children are Injured and Killed each year by Vaccines, DON’T talk to me about measles! ~ This article reveals TWO of these cover-ups: Tinyurl.com/SSPE1972. Journalist Christina England uncovers the measles vaccine causing SSPE which is a deadly form of Autism (dates back to 1972). Dr. Carley has been saying this for YEARS! + The 2015 revelation of a 2003 Cover-up of the MMR vaccine causing 2.4 times the rate of Autism in black boys and is referred to as “Tuskegee II”. The public COMMENTS under this video reveal that everyone has AWOKEN to the ruse of vaccination. Here was my comment, but definitely open video link for the others. Components in Vaccines: Tinyurl.com/VaccineContents from the CDC. The AUTISM rates in zip codes 11205, 11206, 11211 and 11249 must be measured from before this vaccination campaign and after this campaign. You cannot sue the manufacturer if your child is injured from the vaccine. There is a fund which most are not informed about until the timeframe for them to get compensation has expired (3 years for injury and 2 years for death). Few ever receive compensation and if they do it is a small sum. This fund is paid for by the consumer. Measles, naturally acquired are a blessing in that you will have lifelong solid protection from getting them again and also be protected from cancers, asthma and allergies. * If you are injected with an MMR vaccine, you will be offered boosters (because their vaccines don’t work). Safety studies are lacking. Who does this vaccine truly benefit? *WILD MEASLES ARE A BLESSING! Having interviewed 1,000 VACCINE VICTIMS and victim’s families, I am utterly REPULSED by this falsehood parading as a health emergency. GET MEASLES, GET WELL, GET REAL IMMUNITY! Everyone who commented under the video of Mayor DeBlasio’s NYC press conference regarding a measles outbreak was AWAKE to the LIES being pushed by these Pharma TOOLS! They are the same tired lies we have been fed for a Century and they’re ALL in H.Res.327 (sponsored by Rep. Adam Schiff) and dismantled by Naturopath and vaccine historian Amanda Vollmer here: Tinyurl.com/Dismantle327. Feel free to add information to the comments area. We must Unite to Save Our Children: Call for a Moratorium on Vaccination NOW! Author BrightFuture83Posted on April 17, 2019 April 18, 2019 10 Comments on Until you are Outraged over how many Children are Injured and Killed each year by Vaccines, DON’T talk to me about measles! Smiling through Ridicule, Censorship and Attacks, all the while Knowing what will Result if ADULTS REFUSE to WAKE UP and Act Responsibly to Save Children & Themselves from Forced Vaccination. It’s not coming, it’s HERE! LISTEN to report on my meeting with Congressman Bill Posey on March 6, 2019 and hear about the most important issues facing us currently pertaining to vaccination: http://tobtr.com/11242703. Top 3 issues: #MeaslesGate (added 2nd measles shot to childhood schedule with then: premeditated outbreaks, blaming of unvaccinated and removal of exemptions), #VaccineGate (zero antigens making vaccines all risk, no benefit as presented to the Italian Parliament, see video footage when you scroll down) and #RestorePharmaLiability (which, short of a ban would resolve all these problems instantly and has immense support because of it’s popularity with the massive number of misinformed pro-vaxxers, since even they want recourse if their child is injured). Additionally, the Senate hearing revealed we must #RepealSmithMundtModernizationAct which allows our Government to propagandize the American people using all forms of media. Criteria for determining if a vaccine caused an ailment as set forth by the European Union (answer 3 questions): 1) Did your child have this ailment prior to vaccination? 2) Is there a history of this ailment in your family? 3) Do other people suffer from the same ailment post-vaccination? If you answered No/No/Yes, THE VACCINE CAUSED IT! Having interviewed a thousand parents of vaccine injured or dead children, I assure you that each parent I have interviewed about their child’s ailment/death FITS these CRITERIA! Trying to awaken people to their own demise after a CENTURY of DECEIT regarding vaccines is the hardest job imaginable! Here are responses to the stock lies which have been perpetrated on the American public (and the world, but this one is sponsored by Adam Schiff and presented as H. Res. 327) as dismantled by Naturopath and vaccine historian Amandha Vollmer: Tinyurl.com/Dismantle327. Vaccination is referred to by those who KNOW as “The Greatest Lie Against Humanity”. What do I really mean by that? In a word SURVIVAL. We have literally TRASHED a generation of children who will never recover from all the poisons injected into them. Who among them knows NOT to turn back to the perpetrators (the alopaths) for help? I’m not sure we are going to win this battle for the lives of our children and their offspring (if vaccines have not robbed their fertility), but is it too much to want your children to outlive you? Is it preposterous to expect they might have independent futures and children of their own? The ANSWER is “YES, it is both ‘too much’ and ‘preposterous’ at the rate they are being vaccinated!” Children receive 72 doses of these toxic poisons thru age 18: Tinyurl.com/VaccineContents. 33 doses through infancy alone when nothing other than mother’s milk will serve to protect them. We are destroying their immune systems. The OPPOSITE of what you have been informed by those who will profit from their ill health. MEASLES are a BLESSING! Did you know that acquiring measles naturally protects you for life from measles and also “PROTECTS against CANCERS, ASTHMA and ALLERGIES”? 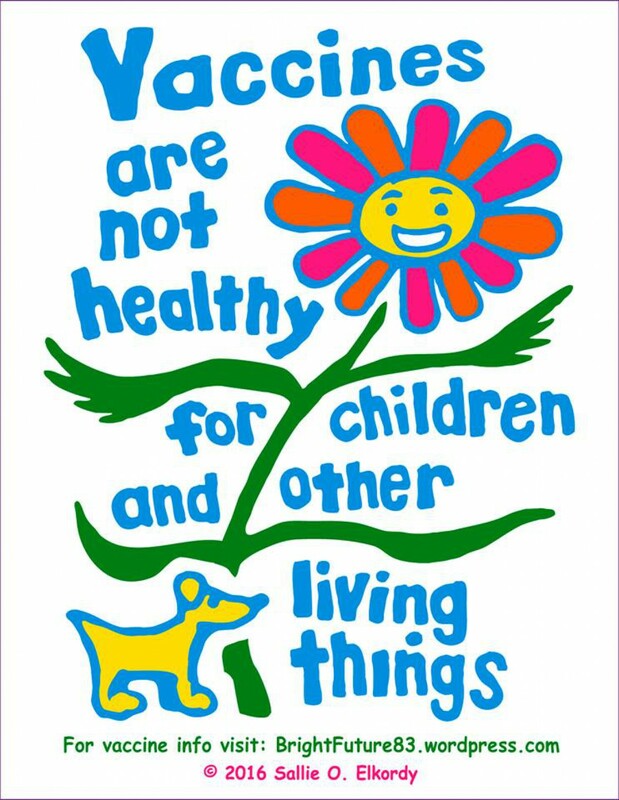 Of course not, people might seek the natural immunity of measles if they knew (as they used to do before the measles vaccine), in lieu of the madness that is being promoted regarding the dangers of what may be the BEST GIFT your child ever receives! This information is gleaned from Dr. Scheibner’s text as spoken in this video along with, “vaccine-preventable is false advertising” (presentation to the US Department of Health and Human Services 6/7/16 https://youtu.be/FGyz177n9Uo). Dr. Scheibner also has been quoted as saying “vaccines have never been proven to prevent any disease”! What if I told you that the ENTIRE premise of vaccination, which is to build antibodies against a virus, was a LIE? You would be pretty mad, right? Well, the contents within vaccines do not possess the Antigens the vaccine pushers claim to protect us against as put forth in #VACCINEGATE. Watch the presentation to the Italian Parliament (with English subtitles, which will air in NYC on television in April of 2019): https://www.youtube.com/watch?v=cXgveWHqQMY. Read the latest on how the Italian government is responding. Considering the outspokenness of the people against mandates, you will rightfully be appalled: https://vaxxter.com/italian-health-officials-no-vaccine-no-school/. Listen to the radio program atop this blog update for detailed information, then scroll down for many stories and statistics to encourage your activism. Get active or get vaccinated. Sallie O. Elkordy (previously at Facebook.com/VaccineFreeNYC). Still running for Mayor of NYC. Not interested in the position if there are no more children, however! P. S. Listen to all the interviews I have conducted recently on the issue of censorship along with the FACTS they are attempting to censor. Please SHARE while you still can! Author BrightFuture83Posted on February 27, 2019 April 3, 2019 3 Comments on Smiling through Ridicule, Censorship and Attacks, all the while Knowing what will Result if ADULTS REFUSE to WAKE UP and Act Responsibly to Save Children & Themselves from Forced Vaccination. It’s not coming, it’s HERE! YELLOW VESTS Alert the World that “SIDS IS VIDS” (Vaccine Induced Death Syndrome) to Spare Children, Parents & Carers! GET REAL NOW: 72 Doses of Poison Kills, Sterilizes and will result in Euthanasia of the Adult Damaged Survivors who will outnumber those well enough to care for them. Direct from the Centers for Disease Control (CDC.gov), here are the ingredients in Vaccines http://tinyurl.com/VaccineContents which you will see for yourself are toxic and the schedule of childhood shots http://tinyurl.com/72ChildVaxDoses which have TRIPLED since Congress lifted liability from the manufacturers and healthcare workers back in 1986. Children receive 72 vaccine doses now (up from 3 in the 1950s, 5 in the 1960s and 24 in the 1980s) with more than a third of them given in infancy! The Supreme Court upheld the lack of liability for the medical manufacturers and doctors because vaccines are “unavoidably unsafe” (sounds like the best reason to BAN vaccines). It all comes down to common sense, which can spare you, your children and anyone you will educate (http://Tinyurl.com/VaccineFreeWorld) from becoming another statistic on the VAERS report of vaccine injury and death (which most people don’t even know exists and reflects a minuscule percentage of adverse reactions to vaccines) and the VICP (vaccine injury compensation program: https://www.hrsa.gov/sites/default/files/hrsa/vaccine-compensation/data/monthly-stats-february-2019.pdf), which is funded by the purchaser (you) and has payed out 4 billion dollars to injured people, which is a tiny amount compared to the actual costs incurred for vaccine injuries and deaths. We’re told vaccines are “safe and effective” but must awaken to “The Greatest Lie Ever Told” if we are to save ourselves (just wait till you see the adult schedule! ), and especially our children. As it stands; if children even have a future, it will not be an independent one… and who will be left to care for them when they are grown if everyone then mature is injured themselves? This is prescription for an unsustainable disaster which will lead to euthanasia. Please help STOP IT. If there is a more persistent deceit than vaccination, I cannot fathom what that would be. Here are two parents; both have lost children from vaccination, speaking about how this all transpired. These stories are typical as are the reactions to the vaccines themselves and you will do a great service to young couples by sharing this information with them before they too TRUST a system which has proven itself time and again to be working against humanity instead of on it’s behalf. Listen to “The OUTRAGE that is VACCINES!” with bereaved parents Ronnie Prine and Alisa Neathery: http://tobtr.com/s/9754513. and here are 2 grandmothers, both former vaccinators themselves who lost their grandchildren to vaccines, Gaela Fisher and Valerie Murfin: http://tobtr.com/s/6446907. Radio interview with Christina England on Shaken Baby Syndrome (SBS) regarding a young couple (spoken of in the video above) who lost their infant post vaccination and are now DEAD themselves: http://www.blogtalkradio.com/themaryandsallieshow/2016/03/12/baby-as-parents-wrongfully-accused-dead-christina-england-host-elkordy. You will hear the parents as well (recorded on the night prior to their trial). Another interview with Ms. England and Bryant Arroyo who I also referred to in the above video: http://tobtr.com/s/6446907. This interview took place just prior to his being transferred to a maximum security prison for entrusting his child to a pediatrician’s needle (thug life, right? ): Another story, this of a father who was convicted using the wrong child’s scans and there was proof that this child died through vaccines https://vactruth.com/2014/01/16/death-after-8-vaccines/. Read this article, also by Ms. England about 13 father’s in one wing of one jail for SBS: https://healthimpactnews.com/2015/thirteen-men-in-one-prison-jailed-for-shaken-baby-syndrome-after-possible-vaccine-injuries-had-occurred/. According to Christina there are no cases of Shaken Baby Syndrome in an unvaccinated child. See the video in the comments area beneath entitled, “Vaccine Cover-up”. Naturally, the Autism connection to vaccines has been covered-up by the same criminals who are responsible for injecting our children with toxic poisons (see mind-blowing Tinyurl.com/NoAntigens) and the latest cover-up exposed: https://www.youtube.com/watch?v=1XUM2gvfbW8. I have so much more to share with you, but if you realize that INDEED VACCINES KILL (conservatively 10-12% of infants as of 2010, scroll down for more on this) and CAUSE AUTISM (1 in 36 as of the 2016 National Survey http://tobtr.com/s/10459877, and has been known since at least 1972: Tinyurl.com/SSPE1972), you will know a great deal. Do not neglect to listen to interviews with HPV vaccine victims here: Tinurl.com/LegacyHPV because the injuries sustained from this vaccine are overwhelming; and extensive damage has been brought by the DTaP vaccine, much of which is covered here: http://tobtr.com/11128277. The MMR and Flu Shot reactions are covered here with Dr. Rebecca Carley: http://tobtr.com/s/10948327. P. P. P. S. If you remember nothing else, remember this, “ALWAYS REJECT EVERY VACCINE” for yourself and your children and EDUCATE others: RISK RIDICULE (from the ignorant and incentivized) AND SAVE A CHILD! Author BrightFuture83Posted on January 19, 2019 February 26, 2019 10 Comments on YELLOW VESTS Alert the World that “SIDS IS VIDS” (Vaccine Induced Death Syndrome) to Spare Children, Parents & Carers! ~ CDC expert Dr. Zimmerman, who appeared on Sharyl Atkinson’s “Full Measure” television program states that vaccines DO cause autism (Brighteon.com/5987267866001) and was fired for changing his stance from the contrary (article by Catherine J. Frompovich https://www.activistpost.com/2019/01/cdcs-own-expert-vaccine-court-witness-confirmed-vaccines-can-cause-autism-so-they-fired-him-immediately.html). This article, on the Autism Omnibus proceedings illustrates the impact this cover-up has had on thousands of families with autism: https://childrenshealthdefense.org/child-health-topics/righting-wrongs/request-for-office-of-inspector-general-to-investigate-fraud-and-obstruction-of-justice/. ~ Hollywood Stars were surprised with FREE FLU SHOTS at the 2019 GOLDEN GLOBE AWARDS as Andy Samberg joyously pronounced, “You’re welcome!” https://www.youtube.com/watch?v=seqKlU3rTrA. Will Keith Urban’s rejection of this shot cost him his career? https://www.elle.com/uk/life-and-culture/a25768878/keith-urban-flinching-in-horror-at-the-golden-globes-flu-shots/. Vaccines may actually be the new “pay” in “pay to play”. Since I wouldn’t wish this on anyone, perhaps now those who are in a position to reach millions through their fan bases will act responsibly toward those fans by educating them to the dangers of vaccines. Welcome to OUR WORLD! Highlight for the Year 2018 was an interview with Congressman Bill Posey of Florida. Representative Posey was also our Honoree for October Vaccine Injury Awareness Month this year. “Parents Praise Posey” for his Courage (see ensuing blog). Below you will find the most POPULAR programs (judged by the number of listens to the programs) to air on “The Mary and Sallie Show” in 2018 (starting with January and going through December with 2 two-part interviews). Mighty Alfie vs Medical, Political & Judicial System + Autism Up 15% in 2 Years! The entire archive dating back to 2011 can be found at Tinyurl.com/VaccineFreeRadio. NY & NJ Parents Praise Posey & TESTIFY to Save Humanity from Vaccines! Here is the legislation that Congressman Bill Posey sponsored, which was one of several reasons we celebrated him for October Vaccine Injury Awareness Month 2018. The bill calls for a Vaccinated vs. Unvaccinated Study: Tinyurl.com/HR3615. The video, which was recorded by James Lane will air in NYC on television during December. Two separate programs, both of which you can watch above: first “Fantastic Forum NY Parents” and directly following, “Fantastic Forum NJ Parents”. If you wish to air one or both of these hour-long programs on your local public access television station, please contact me (Sallie) here: Tinyurl.com/VaccineFreeNYC. Please become an EXPERT yourself because our numbers must grow at an accelerated pace to save humanity in actuality. This link has tremendous resources which I hope you will investigate, and therefrom educate: Tinyurl.com/VaccineFreeWorld. Author BrightFuture83Posted on November 16, 2018 November 16, 2018 7 Comments on NY & NJ Parents Praise Posey & TESTIFY to Save Humanity from Vaccines! Most COMPELLING interviews (determined by number of listens) from SEVEN NATIONS: Australia, Belgium, England, India, Italy, Poland and the USA. P. S. Please PARTICIPATE for October Vaccine Injury Awareness Month by TESTIFYING to your children’s injuries or death post-vaccination on Saturday, October 13th at 2pm in NYC. We are also HONORING Congressmen Carolyn Maloney & Bill Posey for sponsoring legislation to conduct an ‘Official Vaccinated vs. Unvaccinated Study’ http://Tinyurl.com/OctoberFantasticForum.